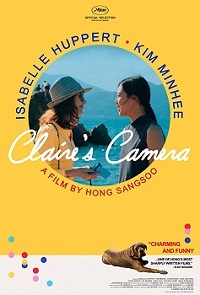 In Claire's Camera, a philandering film director is again a major plot point and Kim Minhee, again the star. But this time the mood is light and airy as a summer breeze, thanks in large part to a lively performance from Isabelle Huppert (The Piano Teacher, Elle). Huppert plays Claire, a school teacher with a camera that might be magical on her first visit to Cannes. She happens upon a film sales assistant, Manhee (Kim), recently fired from her job and also meets So Wansoo (Jung Jinyoung), a film director whose one-night stand with Manhee was the reason for her firing. Beneath the humor and charm on the surface of Claire's Camera, Hong explores the power of images to transform us. "The only way to change things," says Claire, "is to look at them again very slowly."